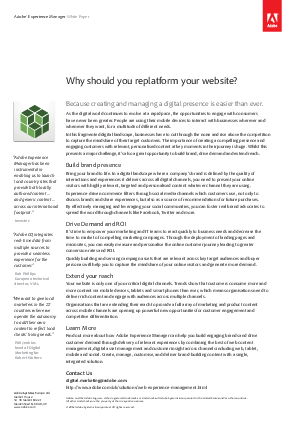 > Adobe > Why should you replatform your website? Because creating and managing a digital presence is easier than ever. As the digital world continues to evolve at a rapid pace, the opportunities to engage with consumers have never been greater. People are using their mobile devices to interact with businesses wherever and whenever they want, for a multitude of different needs. In this fragmented digital landscape, businesses have to cut through the noise and rise above the competition to capture the mind-share of their target customers. The importance of creating a compelling presence and engaging customers with relevant, personalized content at key moments in their journey is huge. Whilst this presents a major challenge, it's also a great opportunity to build brand, drive demand and extend reach.